Coming off a strong 2017 season both at the plate and in the field, Los Angeles Dodgers outfielder Yasiel Puig was primed for further success in 2018. He looked to pick up where he left off from his resurgent campaign, but immediately slumped to begin the year. Puig hit just .193/.250/.250 for the entire month of April, recording only five extra-base hits in 96 plate appearances. From that point on, Puig bounced back with stellar offensive statistics and salvaged his season. In May, he batted .283/.367/.604 with five home runs after not hitting any during the previous month. Despite the rough showing in April, Puig finished the first half with above-average offensive production. He hit .265/.325/.462 with 17 doubles, 11 homers and 35 RBI over 277 trips to the plate (76 games) to that point. Puig didn’t slow down and only improved in the second half, boosting his slash line to .270/.329/.546. In nearly 100 fewer plate appearances, he hit more home runs (12) and drove in 28 RBI with his efforts. The best was yet to come for Puig, who elevated his game to another level in the postseason. 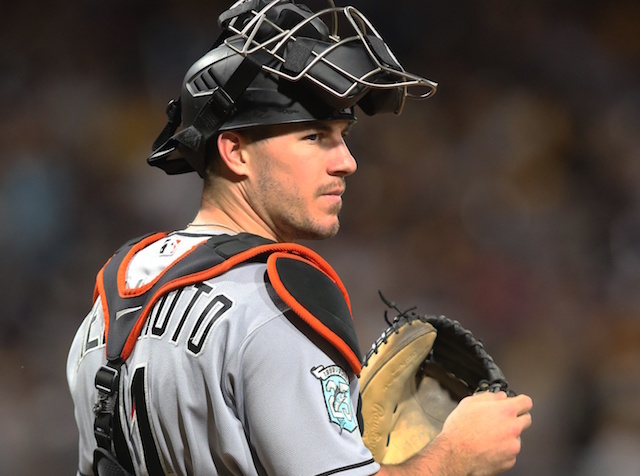 Against the Atlanta Braves in the National League Division Series, he hit .333/.538/.333 while drawing more walks (four) than strikeouts (three) in four games. Puig followed up that performance by batting .333/.364/.619 with three doubles and one home run in seven games against the Milwaukee Brewers in the NL Championship Series. His three-run homer came in the deciding Game 7, which was the final blow to cap off an impressive road win. Puig had his moments in the World Series as well, but struggled to find consistency like many of his teammates against the Boston Red Sox pitching staff. He hit just .250/.286/.400 in five games, capping off an otherwise solid 2018 season. In Game 4 of the 2018 World Series against the Boston Red Sox, Puig energized the Dodgers with a three-run home run off Eduardo Rodriguez that gave the club a 4-0 edge at the time. The blast put Los Angeles in the driver’s seat to potentially even up the series with two wins apiece. Unfortunately, the Dodgers bullpen would squander that lead and wound up losing the contest by a final score of 9-6, falling behind, 3-1, in the Fall Classic. 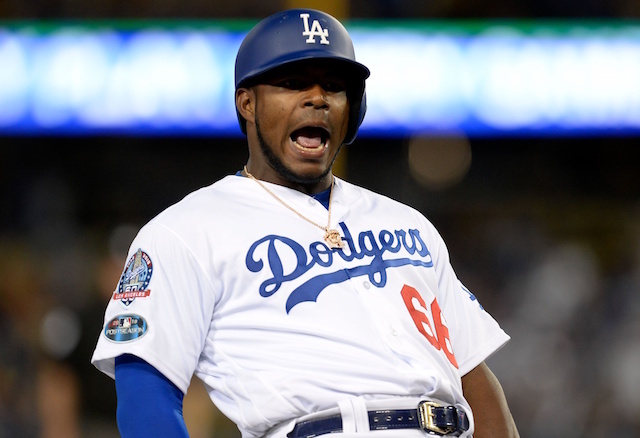 Arbitration-eligible for the first time in his career, Puig was tendered a contract for the 2019 season. 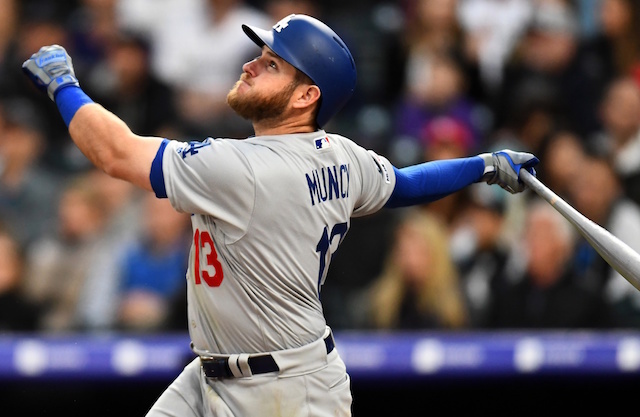 However, whether he remains with the Dodgers through the offseason will be an interesting development to follow. One year away from reaching free agency, Puig has again found himself in the midst of trade rumors. His name has floated around in talks with the Cleveland Indians for Corey Kluber, and there’s an expectation that the New York Mets will inquire on him this offseason as well. Puig is reportedly open to the idea of moving on from the Dodgers, as he particularly wasn’t fond of being platooned last season. All of that considered, it wouldn’t be surprising if Puig suits up for another organization in 2019.